Centre d’art Sa Quartera, Centro socio-cultural del Consell de Mallorca, Inca. Artists: Martin John Callanan (UK), Adam Chapman (US), Thorsten Knaub (DE), Carlos Macià (ES), Transnational Temps: Verónica Perales, Fred Adam, Andy Deck (ES/FR), Bartomeu Sastre (ES). In 1957, the sociologist Paul-Henry Chombart of Lauwe studied the movements of a young girl living in Paris’s 16th district, and discovered that these were quite limited, a triangle defined by the places where she lived and studied. The city is described in this study as a space defined by our actions not by its topography, but in fact the curious relationship between the citizen and the environment is something that begins to be apparent well before, at the time of the genesis of the modern metropolis. Already in the mid-nineteenth century, Charles Baudelaire gave special meaning to the action of a walk around the city and said that the artist must be a “botanist of the sidewalk”. He sensed that the city was becoming a great machine to organize people, establishing where to live, where we work and where we spend our free time. Thus, following the suggestion of the French poet, while others fidget through the streets and avenues to fulfill their daily tasks, the artist has to deviate from this traffic flow and see the city as a living organism. Our current reliance on technological gadgets and cars has led us to find our habitat in the metropolis. It is in the city where communication networks, connections and supplies for our machines, as well as the spaces for consumerism, are more abundant and easier to find. We should not forget that the city is formed by its citizens, and therefore it is both the people and the buildings that make up a city. In this sense we can say that over the physical city other invisible cities overlap, made with the emotions of people, past, present and future stories, the digital data passing through neighborhoods by wireless networks, the images projected in all directions and the daily movements of people through the city, of which no trace is left. The city is thus revealed as a territory where there is a lot to explore. Cities have become our natural habitat. Alienated from nature, we have come to live in an environment that we have adapted to our needs (or rather that of our cars), structured according to human logic and distributed in spaces that have been assigned a specific function. As artificial habitat or ecosystem, the city has its own conditions for life and also its own ‘species’, the result of human activity in this environment. The artworks that have been selected for this exhibition suggest a dialogue between the city as habitat, video as a document and discourse, and new media as a factor which enables a new reading of our everyday experience of reality. Urban space defines a particular landscape, marked by the aesthetics of advertising, the noise of machines, the thousands of messages that surround us every day and the dynamics we generate by rutinely moving through certain spaces. 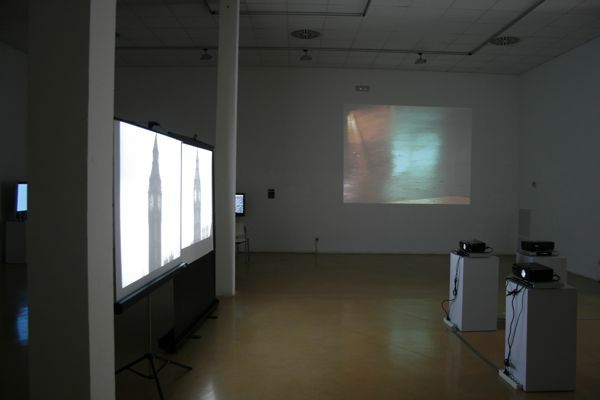 In I Wanted to See the Whole of London (2007), artist Martin John Callanan (Birmingham, 1982) carries out a precise and absurd exploration of the underground network of the British capital through a series of sound recordings that a computer selects in order to create a random trip through the city. In a screen we can see only the colors that distinguish the different lines of the London Underground, while the recorded sounds reproduce everything the artist heard while traveling around the city. The viewer can imagine this trip while listening to the sounds and perform a “blind” tour of London, which reminds us how the underground denies the vision of the city and reduces it to a set of strategic points . Thorsten Knaub (Erlangen, 1967) carries out what we might consider the reverse form of exploration in London / London (2010), a soundless video of the same city. Knaub picked up a Super 8 tape filmed by his father in 1974 and filmed again in the same places of contemporary London, reproducing the exact camera movements from the original film. The result is a curious exploration of time and particularly on the viewer’s gaze at the constantly changing environment of the metropolis. The city that Callanan visits, underground and logical, has nothing to do with Knaub’s London, in which the main focus in on a ecstatic contemplation of the topics of the city, monuments and leisure areas where only tourists inhabit. 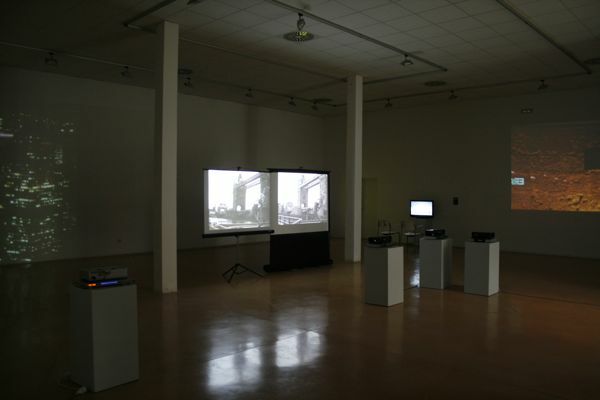 The artist also explores the particular aesthetics of the urban environment in Counterweight (2007), a video documentary and a visual poem that shows the construction of the sculpture The Flying Steamroller by Chris Burden while exploring the beauty of machines and industrial environments that we associate with our everyday experience of the city. One aspect Knaub’s work is it attention to memory in a city permanently directed towards the present and the future. 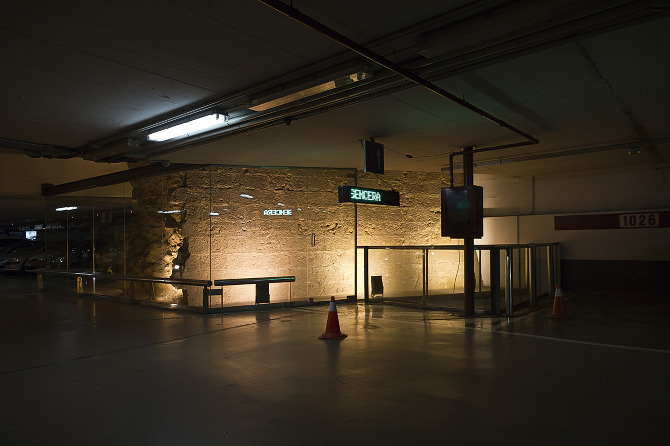 Bartomeu Sastre (Palma, 1986) explores the history of the city in the form of an intervention with a certain poetic character in M’hauria agradat coneixer-te sencera (2010), an intervention that took place in an underground car park in Palma and was documented in a video. The phrase (“I would have liked to know you whole”), which seems drawn from the context of an intimate conversation between two people, is displayed on a LED sign that is apparently dedicated to the remains of a medieval wall that has been left mutilated on the side of the parking lot. The cold and impersonal aspect of the device chosen to display the phrase creates a sharp contrast to what is communicated. 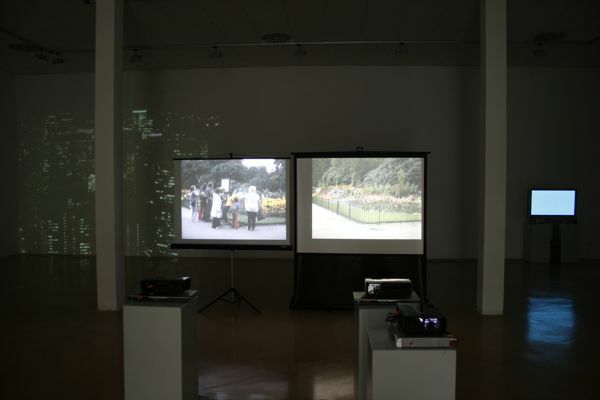 This contrast also shows in Agenda de actividades (2010), a sound installation created jointly with Marcos Cuesta, in which a synthetic voice repeats intimate phrases as locution for a public space. The city is shown as a place full of life, but where is nature? The wildlife, fauna and flora seem just a memory, as they are assigned a marginal space within the urban grid. 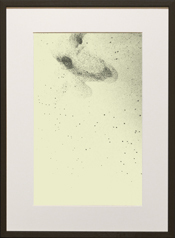 In The Starling Drawings (2008), Adam Chapman (Los Angeles, 1973) uses several videos of flocks of starlings, which have been edited to eliminate all elements except the birds, and displays them on a screen framed as a picture and covered with paper. The flight of the birds looks like a drawing in constant transformation reminiscent both of the autumn cityscape as well as the small daily migrations of the inhabitants of the city. Although originating in a very specific image, the result leads to an abstract representation, as well as the impression of being in front of something to decipher. The restless drawing of birds elaborated by Chapman contrasts with the solemn stillness of the videos by Carlos Macià (Lugo, 1977), who presents two visions of the urban landscape made in Japan. Mori Tower [Version 1] (2010) is an hypnotic night vision of the Japanese capital from the upper floors of one of its most iconic skyscrapers. The darkness blurs the outlines of buildings and shows an almost abstract landscape, a constellation or a strange grouping of fireflies. Shimokitazawa (2010), in contrast, shows an everyday scene as if it were a still life, a space for contemplation. The unusual look into an environment that we usually do not care to notice, is a characteristic feature of these works. The last project in this selection carries out a true exploration of the city as a habitat of various species. Safari Urbis (2011) is a project of urban intervention designed by the artist collective Transnational Temps, who use new media and participatory dynamics to discuss issues related to the environment and animal life on our planet. in Inca, a specific Safari Urbis has been created to explore the city center, inviting citizens to “hunt” for wild fauna that can be found in store windows, on billboards and everyday objects such as logos, drawings , photos and even textures. Lions, elephants and giraffes are part of our everyday environment as representations that give us a false impression of maintaining contact with these animals, while ignoring that they are in danger of extinction, with just over 300 in the wild worldwide. Through a workshop held with schools, artists create a map of the “wildlife” in the city and provide a way to make us aware about our contradictory relationship with nature. Martin John Callanan (Birmingham, 1982) explora en su trabajo el concepto de proceso aplicado a una obra sin fin y la manera en que la tecnología afecta a nuestra vida cotidiana y nuestra existencia en un mundo hiperconectado. I Wanted to See the Whole of London es una exploración precisa y absurda de la red del metro de la capital británica que el artista realiza mediante una serie de grabaciones de audio que un ordenador selecciona confeccionando un recorrido aleatorio por la ciudad. El espectador puede imaginar este viaje mientras escucha los sonidos y obtiene como única referencia visual el color de la línea en que se encuentra. Adam Chapman (Los Angeles, 1973) centra su interés en las dinámicas de los organismos vivos, los ritmos de la naturaleza y el paso del tiempo. En The Starling Drawings, el artista ha recogido varios vídeos de bandadas de estorninos, los ha editado para eliminar todo elemento excepto a los pájaros y los ha dispuesto en una pantalla enmarcada como un dibujo y cubierta con un papel. De este modo, el vuelo de los pájaros se convierte en un dibujo en transformación constante que nos recuerda tanto el paisaje urbano del otoño como las pequeñas migraciones diarias de los habitantes de la ciudad. Thorsten Knaub (Erlangen, 1967) centra su obra en el trabajo con la imagen en movimiento y el espacio como entorno y representación. Counterweight es al mismo tiempo un vídeo documental y un poema visual que nos muestra la construcción de la escultura The Flying Steamroller de Chris Burden mientras explora la belleza de las máquinas y los entornos industriales que asociamos con nuestra experiencia cotidiana de la ciudad. Un aspecto muy diferente de la experiencia urbana es la del turista: en London/London, Knaub recoge una cinta en Super8 filmada por su padre en el año 1974 y la reproduce con total fidelidad en los mismos lugares del Londres actual. El resultado es una curiosa exploración del paso del tiempo y la particular mirada del visitante sobre el entorno en cambio constante de la metrópolis. Carlos Macià (Lugo, 1977) ha desarrollado en su obra una concepción expandida de la pintura, que invade el espacio, y también a la inversa, se ha dedicado a explorar la percepción de la realidad como una composición plástica. En sus vídeos realizados en Japón, el artista nos presenta varias visiones de la ciudad en la que esta se convierte en un tableau vivant que se presta a esa contemplación calmada que habitualmente no dedicamos a nuestro entorno. El colectivo de artistas Transnational Temps emplea las nuevas tecnologías y una dinámica participativa para tratar temas relacionados con el medio ambiente y la vida animal en nuestro planeta. En Safari Urbis invitan a los ciudadanos a “cazar” ejemplares de fauna salvaje que se pueden encontrar en la ciudad en forma de logotipos, dibujos, fotos y objetos cotidianos. Mediante un taller que se lleva a cabo con escuelas, los artistas crean un mapa de la “fauna” de la ciudad y nos llevan a concienciarnos sobre nuestra relación contradictoria con la naturaleza. Bartomeu Sastre (Palma, 1986) es un artista emergente que está desarrollando una interesante exploración de los espacios de la vida cotidiana desde una perspectiva a la vez poética y conceptual. Su obra se inserta en el paisaje urbano mediante frases íntimas que integra en el entorno, provocando un encuentro inesperado con los ciudadanos. Artistas: Martin John Callanan (Regne Unit), Adam Chapman (Estats Units), Thorsten Knaub (Alemanya/ Regne Unit), Carlos Macià (Espanya), Transnational Temps: Verónica Perales, Fred Adam, Andy Deck (França/Espanya), Bartomeu Sastre (Espanya). En 1957, el sociólogo Paul-Henry Chombart de Lauwe estudia los movimientos de una joven del distrito 16 de París, y descubre que estos son bastante limitados, un triángulo definido por los lugares dónde vive y estudia. La ciudad se muestra, a partir de este estudio, como un espacio más definido por nuestras acciones que no por su topografía, pero de hecho la curiosa relación entre el ciudadano y su entorno es algo que empieza a hacerse patente mucho antes, en el momento mismo de la génesis de la metrópoli moderna. Ya en la mitad del siglo XIX, Charles Baudelaire otorgó un significado especial a la acción de dar un paseo por la ciudad y afirmó que el artista debe ser un “botánico de la acera”. Presentía que la ciudad se estaba convirtiendo en una gran máquina de organizar la gente, estableciendo dónde deben vivir, en qué lugares deben trabajar y dónde deben pasar su tiempo libre. Así, siguiendo la sugerencia del poeta francés, mientras que otras personas se mueven nerviosamente por las calles y avenidas para cumplir con sus funciones, el artista ha de apartarse de este flujo de tránsito y ver la ciudad como un organismo vivo. Nuestra dependencia actual de los aparatos tecnológicos y los coches nos ha llevado a encontrar nuestro habitat en la metrópolis. Es en la ciudad donde las redes de comunicación, las conexiones y suministros para nuestras máquinas, así como los espacios dónde desarrollar nuestros hábitos de consumo son más abundantes y fáciles de encontrar. No hay que olvidar que la ciudad también la forman todos los ciudadanos, y por lo tanto son tanto las personas como los edificios los que conforman una ciudad. En este sentido podemos decir que a la ciudad física se superponen otras, ciudades invisibles, hechas con las emociones de las personas que viven, las historias pasadas, presentes y futuras, los datos digitales que atraviesan los barrios gracias a las redes sin hilos, las imágenes proyectadas en todas las direcciones y los desplazamientos cotidianos de los cuales que no queda ningún rastro. La ciudad se revela así como un territorio donde hay mucho por explorar. Las ciudades se han convertido en nuestro habitat natural. Alejados de la naturaleza, nos hemos acostumbrado a vivir en un entorno que hemos adaptado a nuestras necesidades (o más bien a la de nuestros coches), estructurado según una lógica humana y distribuido en espacios a los que se ha asignado una función concreta. Como habitat o ecosistema artificial, la ciudad presenta unas condiciones propias para la vida y también unas “especies” propias, fruto de la propia actividad humana en su entorno. Las obras de varios artistas nos proponen, dentro esta temática, un diálogo entre la ciudad como habitat, el vídeo como documento y discurso, y las nuevas tecnologías como factor que posibilita una nueva lectura de nuestra experiencia cotidiana de la realidad. El espacio urbano define un paisaje particular, marcado por la estética de los anuncios, el ruido de las máquinas, los miles de mensajes que nos rodean cada día y las dinámicas que establecemos al recorrer mecánicamente unos espacios determinados. En I Wanted to See the Whole of London (2007), el artista Martin John Callanan (Birmingham, 1982) lleva a cabo una exploración precisa y absurda de la red de metro de la capital británica mediante una serie de grabaciones de sonido que un ordenador selecciona confeccionando un recorrido aleatorio por la ciudad. En una pantalla se muestran únicamente los colores que distinguen las diferentes líneas del metro londinense, mientras los sonidos que emiten unos altavoces reproducen todo aquello que el artista oyó mientras transitaba por la ciudad. El espectador puede imaginar este viaje mientras escucha los sonidos y lleva a cabo un recorrido “ciego” por Londres, lo cual nos recuerda como este medio de transporte, el metro, niega la visión de la ciudad y la reduce a un conjunto de puntos estratégicos. Thorsten Knaub (Erlangen, 1967) lleva a cabo el que podríamos considerar la exploración inversa al reproducir, en London/London (2010), un video de la misma ciudad en el que se imponen las imágenes y no hay ningún sonido. Knaub recogió una cinta en Super8 filmada por su padre en 1974 y la reproduce con total fidelidad en los mismos lugares del Londres actual. El resultado es una curiosa exploración del paso del tiempo y la particular mirada del visitante sobre el entorno en cambio constante de la metrópolis. El Londres que transita Callanan, subterráneo y lógico, no tiene nada a ver con este Londres expuesto por Knaub en el que predomina la contemplación extasiada de los tópicos de la ciudad, los monumentos y espacios de ocio dónde sólo los turistas habitan. El artista también nos propone observar la particular estética del entorno urbano en Counterweight (2007), al mismo tiempo un vídeo documental y un poema visual que nos muestra la construcción de la escultura The Flying Steamroller de Chris Burden mientras explora la belleza de las máquinas y los entornos industriales que asociamos con nuestra experiencia cotidiana de la ciudad. Un aspecto del trabajo de Knaub es su reivindicación de la memoria dentro el espacio de la ciudad permanentemente dirigida hacia el presente y el futuro. Bartomeu Sastre (Palma, 1986) explora la memoria de la ciudad en forma de una intervención con un cierto carácter poético en M’hauria agradat coneixer-te sencera (2010), una intervención que llevó a cabo en un aparcamiento subterráneo de Palma y posteriormente documentó en un vídeo. La frase, que parece extraída del contexto de una conversación íntima entre dos personas, se muestra en un rótulo de LEDs y parece dedicada a los restos de una muralla medieval que se conserva, mutilada, en un lado del aparcamiento. El aspecto frío e impersonal del dispositivo escogido para mostrar la frase crea un fuerte contraste con lo que esta comunica. 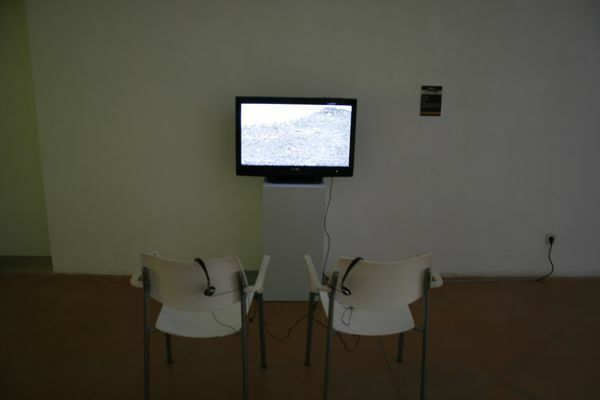 Este contraste se muestra también en Agenda de actividades (2010), una instalación sonora creada conjuntamente con Marcos Cuesta, en la cual una voz sintética reproduce frases íntimas en forma de locución para un espacio público. La ciudad se muestra así como un espacio lleno de vida, pero ¿dónde está la naturaleza? La vida salvaje, la fauna y la flora parecen sólo un recuerdo, mientras tienen asignado un espacio marginal dentro la cuadrícula urbana. 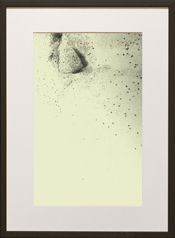 En The Starling Drawings (2008), Adam Chapman (Los Angeles, 1973) recoge varios vídeos de bandadas de estorninos, que ha editado para eliminar todo elemento excepto los pájaros y ha dispuesto en una pantalla enmarcada como un dibujo y cubierta con un papel. De este modo, el vuelo de los pájaros parece un dibujo en transformación constante que nos recuerda tanto el paisaje urbano del otoño como las pequeñas migraciones diarias de los habitantes de la ciudad. Aunque se origina en una imagen muy concreta, el resultado nos conduce hacia una representación abstracta, y la impresión de encontrarnos delante de algo que se debe descifrar. El dibujo inquieto de los pájaros que elabora Chapman contrasta con la solemne quietud de los vídeos de Carlos Macià (Lugo, 1977), quien nos presenta dos visiones del paisaje urbano realizadas en Japón. 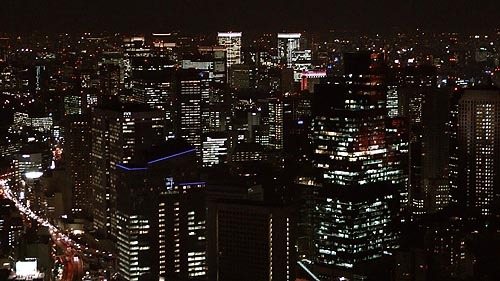 Mori Tower [versión 1] (2010) es una hipnótica visión nocturna de la capital nipona desde los pisos superiores de uno de los sus rascacielos más emblemáticos. La oscuridad desdibuja los contornos de los edificios y nos muestra un paisaje casi abstracto, una constelación o un extraño agrupamiento de luciérnagas. En Shimokitazawa (2010), al contrario, nos muestra una escena cotidiana como si se tratara de una naturaleza muerta, un espacio para contemplar. La mirada inusual hacia un entorno que normalmente no nos paramos a observar es un rasgo característico de estas obras, que hace de los artistas los “botánicos de la acera” que proponía Baudelaire. El último proyecto de esta selección lleva a cabo una verdadera exploración de la ciudad como habitat de varias especies. Safari Urbis (2011) es un proyecto de intervención urbana concebido por el colectivo de artistas Transnational Temps, quienes emplean las nuevas tecnologías y una dinámica participativa para tratar temas relacionados con el medio ambiente y la vida animal en nuestro planeta. en Inca, un Safari Urbis específico ha sido creado para explorar el centro urbano, invitando a los ciudadanos a “cazar” ejemplares de fauna salvaje que se pueden encontrar en los escaparates de las tiendas, en carteles y objetos cotidianos en forma de logotipos, dibujos, fotos e incluso texturas. Leones, elefantes y jirafas forman parte de nuestro entorno cotidiano como representaciones que nos dan una falsa impresión de mantener un contacto con estos animales, olvidando que se encuentran en peligro de extinción, con poco más de 300 ejemplares en libertad en todo el mundo. Mediante un taller que se lleva a cabo con escuelas, los artistas crean un mapa de la “fauna” en la ciudad y aportan una manera de concienciarnos sobre nuestra relación contradictoria con la naturaleza. Centre d’art Sa Quartera, Centre socio-cultural del Consell de Mallorca, Inca. Artistes: Martin John Callanan (Regne Unit), Adam Chapman (Estats Units), Thorsten Knaub (Alemanya/ Regne Unit), Carlos Macià (Espanya), Transnational Temps: Verónica Perales, Fred Adam, Andy Deck (França/Espanya), Bartomeu Sastre (Espanya). L’any 1957, el sociòleg Paul-Henry Chombart de Lauwe estudia els moviments d’una jove del districte 16è a Paris, i descobreix que aquests són força limitats, un triangle definit pels indrets on viu i estudia. La ciutat es mostra, a partir d’aquest estudi, com un espai més definit per les nostres accions que no pas per la seva topografia, però de fet la curiosa relació entre el ciutadà i el seu entorn és quelcom que comença a fer-se palès molt abans, en el moment mateix de la gènesi de la metròpoli moderna. Ja en la meitat del segle XIX, Charles Baudelaire va atorgar un significat especial a l’acció de fer una passejada per la ciutat i va afirmar que l’artista ha de ser un “botànic de la vorera”. Pressentia que la ciutat s’estava convertint en una gran màquina d’organitzar la gent, establint on han de viure, en quins llocs han de treballar i on han de passar el seu temps lliure. Així, seguint el suggeriment del poeta francès, mentre que altres persones es mouen nerviosament als carrers i avingudes per a cumplir amb les seves funcions, l’artista ha d’apartar-se d’aquest flux de trànsit i veure la ciutat com un organisme viu. La nostra dependència actual dels aparells tecnològics i els cotxes ens ha portat a trobar el nostre habitat en la metròpoli. És a la ciutat on les xarxes de comunicació, les connexions i subministraments per a les nostres màquines, així com els espais on desenvolupar els nostres hàbits de consum són més abundants i fàcils de trobar. Cal no oblidar que la ciutat també la formen tots els ciutadans, i per tant són tant les persones com els edificis els que conformen una ciutat. En aquest sentit podem dir que a la ciutat física, es superposen d’altres, ciutats invisibles, fetes amb les emocions de les persones que hi viuen, les històries passades, presents i futures, les dades digitals que travessen els barris gràcies a les xarxes sense fils, les imatges projectades en totes les direccions i els desplaçaments quotidians dels quals que no en queda cap rastre. La ciutat es revela així com un territori on hi ha molt a explorar. Les ciutats s’han convertit en el nostre habitat natural. Allunyats de la natura, ens hem acostumat a viure en un entorn que hem adaptat a les nostres necessitats (o més aviat a la dels nostres cotxes), estructurat segons una lògica humana i distribuït en espais als que s’ha assignat una funció concreta. Com a habitat o ecosistema artificial, la ciutat presenta unes condicions pròpies per a la vida i també unes “espècies” pròpies, fruit de la pròpia activitat humana al seu entorn. Les obres de diversos artistes ens proposen, dins aquesta temàtica, un diàleg entre la ciutat com a habitat, el vídeo com a document i discurs, i les noves tecnologies com a factor que possibilita una nova lectura de la nostra experiència quotidiana de la realitat. L’espai urbà defineix un paisatge particular, marcat per l’estètica dels anuncis, el soroll de les màquines, els milers de missatges que ens envolten cada dia i les dinàmiques que establim en recórrer mecànicament uns espais determinants. A I Wanted to See the Whole of London (2007), l’artista Martin John Callanan (Birmingham, 1982) porta a terme una exploració precisa i absurda de la xarxa de metro de la capital britànica mitjançant una sèrie de gravacions de so que un ordinador selecciona confeccionant un recorregut aleatori per la ciutat. En una pantalla es mostren únicament els colors que distingeixen les diferents línies del metro londinenc, mentre els sons que emeten uns altaveus reprodueixen tot allò que l’artista va sentir mentre transitava per la ciutat. L’espectador pot imaginar aquest viatge mentre escolta els sons i porta a terme un recorregut “cec” per Londres, la qual cosa ens recorda com aquest mitjà de transport, el metro, nega la visió de la ciutat i la redueix a un conjunt de punts estratègics. Thorsten Knaub (Erlangen, 1967) porta a terme el que podríem considerar l’exploració inversa en reproduir, a London/London (2010), un vídeo de la mateixa ciutat on s’imposen les imatges i no hi ha cap so. Knaub recull una cinta en Super8 filmada pel seu pare l’any 1974 i la reprodueix amb total fidelitat als mateixos indrets del Londres actual. El resultat és una curiosa exploració del pas del temps i la particular mirada del visitant sobre l’entorn en canvi constant de la metròpoli. El Londres que transita Callanan, subterrani i lògic, no te res a veure amb aquest Londres exposat per Knaub en el que hi predomina la contemplació extasiada dels tòpics de la ciutat, els monuments i espais de lleure on només els turistes hi habiten. L’artista també ens proposa observar la particular estètica de l’entorn urbà a Counterweight (2007), al mateix temps un vídeo documental i un poema visual que ens mostra la construcció de l’escultura The Flying Steamroller de Chris Burden mentre explora la bellesa de les màquines i els entorns industrials que associem amb la nostra experiència quotidiana de la ciutat. Un aspecte del treball de Knaub és la seva reivindicació de la memòria dins l’espai de la ciutat permanentment dirigida cap al present i el futur. Bartomeu Sastre (Palma, 1986) explora la memòria de la ciutat en forma d’una intervenció amb un cert caràcter poètic a M’hauria agradat haver-te conegut sencera (2010), una intervenció que portà a terme en un aparcament soterrani de Palma i posteriorment documentà en un vídeo. La frase, que sembla extreta del context d’una conversa íntima entre dues persones, es mostra en un rètol de LEDs i sembla dedicada a les restes d’una murada medieval que es conserva, mutilada, en un costat de l’aparcament. L’aspecte fred i impersonal del dispositiu escollit per mostrar la frase crea un fort contrast amb el que aquesta comunica. Aquest contrast es mostra també a Agenda de actividades (2010), una instal·lació sonora creada conjuntament amb Marcos Cuesta, en la qual una veu sintètica reprodueix frases íntimes en forma de locució per a un espai públic. La ciutat es mostra així com un espai ple de vida, però on és la natura? La vida salvatge, la fauna i la flora semblen només un record on bé tenen assignat un espai marginal dins la quadrícula urbana. 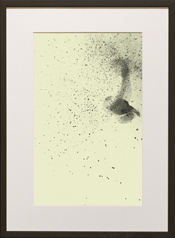 A The Starling Drawings (2008), Adam Chapman (Los Angeles, 1973) recull diversos vídeos de bandades d’estornells, que ha editat per eliminar tot element llevat dels ocells i ha disposat en una pantalla emmarcada com un dibuix i coberta amb un paper. D’aquesta manera, el vol dels ocells esdevé un dibuix en transformació constant que ens recorda tant el paisatge urbà de la tardor com les petites migracions diàries dels habitants de la ciutat. Tot i originar-se en una imatge ben concreta, el resultat ens condueix cap a una representació abstracta, i la impressió de trobar-nos davant de quelcom que hom ha de desxifrar. El dibuix inquiet dels ocells que elabora Chapman contrasta amb la solemne quietud dels vídeos de Carlos Macià (Lugo, 1977), qui ens presenta dues visions del paisatge urbà realitzades al Japó. Mori Tower [versión 1] (2010) és una hipnòtica visió nocturna de la capital nipona des dels pisos superiors d’un dels seus gratacels més emblemàtics. La foscor desdibuixa els contorns dels edificis i ens mostra un paisatge gairebé abstracte, una constel·lació o un estrany agrupament de cuques de llum. A Shimokitazawa (2010), per contra, ens mostra una escena quotidiana com si es tractés d’una natura morta, un espai per contemplar. La mirada inusual cap a un entorn que normalment no ens aturem a observar és un tret característic d’aquestes obres, que fa dels artistes els “botànics de la vorera” que proposava Baudelaire. El darrer projecte d’aquesta selecció porta a terme una veritable exploració de la ciutat com a habitat de diverses espècies. Safari Urbis (2011) és un projecte d’intervenció urbana concebut pel col·lectiu d’artistes Transnational Temps, qui empra les noves tecnologies i una dinàmica participativa per adreçar temes relacionats amb el medi ambient i la vida animal al nostre planeta. A Inca, un Safari Urbis específic ha estat creat per explorar el centre urbà, convidant als ciutadans a “caçar” exemplars de fauna salvatge que es poden trobar en els aparadors de les botigues, en cartells i objectes quotidians en forma de logotips, dibuixos, fotos i fins i tot textures. Lleons, elefants i girafes formen part del nostre entorn quotidià com a representacions que ens donen una falsa impressió de mantenir un contacte amb aquests animals, oblidant que es troben en perill d’extinció, amb poc més de 300 exemplars en llibertat a tot el món. Mitjançant un taller que es porta a terme amb escoles, els artistes creen un mapa de la “fauna” a la ciutat i aporten una manera de conscienciar-nos sobre la nostra relació contradictòria amb la natura. Martin John Callanan (Birmingham, 1982) explora al seu treball el concepte de procés aplicat a una obra sense fi i la manera en què la tecnologia afecta a la nostra vida quotidiana i la nostra existència en un món hiperconnectat. I Wanted to See the Whole of London és una exploració precisa i absurda de la xarxa de metro de la capital britànica que l’artista realitza mitjançant una sèrie de gravacions d’audio que un ordinador selecciona confeccionant un recorregut aleatori per la ciutat. L’espectador pot imaginar aquest viatge mentre escolta els sons i obté com a única referència visual el color de la línia en què es troba. Adam Chapman (Los Angeles, 1973) centra el seu interès en les dinàmiques dels organismes vius, els ritmes de la natura i el pas del temps. A The Starling Drawings, l’artista ha recollit diversos vídeos de bandades d’estornells, els ha editat per eliminar tot element llevat dels ocells i els ha disposat en una pantalla emmarcada com un dibuix i coberta amb un paper. D’aquesta manera, el vol dels ocells esdevé un dibuix en transformació constant que ens recorda tant el paisatge urbà de la tardor com les petites migracions diàries dels habitants de la ciutat. Thorsten Knaub (Erlangen, 1967) centra la seva obra en el treball amb la imatge en moviment i l’espai com a entorn i representació. Counterweight és al mateix temps un vídeo documental i un poema visual que ens mostra la construcció de l’escultura The Flying Steamroller de Chris Burden mentre explora la bellesa de les màquines i els entorns industrials que associem amb la nostra experiència quotidiana de la ciutat. Un aspecte ben diferent de l’experiència urbana és la del turista: a London/London, Knaub recull una cinta en Super8 filmada pel seu pare l’any 1974 i la reprodueix amb total fidelitat als mateixos indrets del Londres actual. El resultat és una curiosa exploració del pas del temps i la particular mirada del visitant sobre l’entorn en canvi constant de la metròpoli. Carlos Macià (Lugo, 1977) ha desenvolupat en la seva obra una concepció expandida de la pintura, que envaeix l’espai, i també a la inversa, a explorar la percepció de la realitat com una composició plàstica. Als seus vídeos realitzats al Japó, l’artista ens presenta diverses visions de la ciutat en la qual aquesta esdevé un tableau vivant que es presenta als nostres ulls per a aquella contemplació calmada que habitualment no dediquem al nostre entorn. El col·lectiu d’artistes Transnational Temps empra les noves tecnologies i una dinàmica participativa per adreçar temes relacionats amb el medi ambient i la vida animal al nostre planeta. A Safari Urbis conviden als ciutadans a “caçar” exemplars de fauna salvatge que es poden trobar a la ciutat en forma de logotips, dibuixos, fotos i objectes quotidians. Mitjançant un taller que es porta a terme amb escoles, els artistes creen un mapa de la “fauna” a la ciutat i aporten una manera de conscienciar-nos sobre la nostra relació contradictòria amb la naturalesa. Bartomeu Sastre (Palma, 1986) és un artista emergent que està desenvolupant una interessant exploració dels espais de la vida quotidiana des d’una perspectiva alhora poètica i conceptual. La seva obra s’insereix en el paisatge urbà mitjançant frases íntimes que integra en l’entorn, provocant un encontre inesperat amb els vianants.